Spectral purity is the key contribution of the Agilent 8663A signal generator, making it ideal for many radar, satellite communication, and phase noise measurement applications. Typical absolute phase noise performance of this generator at a 1 kHz offset is as low as -135 dBc/Hz, depending on the band of operation. The frequency range of the Agilent 8663A is 100 kHz to 2560 MHz. It offers versatile AM, FM, phase (option 002), and pulse modulation using either internal or externally applied modulating signals. A programmable 10 Hz to 99.9 kHz modulation synthesizer provides internal rate generation for all four modulation types and can be swept in either a log or linear fashion. The signal generator also has simultaneous modulation capability. 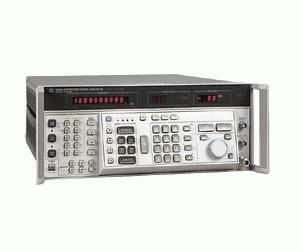 The Agilent 8663A has the U.S. Air Force MATE capability via Option 700. This option is an external translator that allows the signal generator to be controlled by the MATE language, CIIL.